Water-fed poles are the newest piece of window cleaning equipment to hit the window cleaning industry. This is rather funny because the industry can, at times, be slow moving and non-tech. In fact, many window cleaners still use the same style of squeegee originally designed by Ettore Steccone in 1936. The theory has usually been, if it’s not broke, don’t fix it. This is true only up until a certain point. The advent of water fed cleaning has revolutionized window cleaning in the area of two to four story buildings. access the upper floors or be very proficient at using a telescopic pole. Another option was to use a swing but it has a tendency to be cost prohibitive to the building’s owner or management company. Enter the water-fed pole - triumph of modern technology in a low tech field. someone trying to pole a window from 40 feet below would leave streaks. Water-fed poles, however, simplify the process by eliminating the steps to a flawless window. The water is purified, meaning no need to squeegee or dry. Just wet and go over the window a few times with the brush to loosen any debris and flush out the frames. That’s it. Impossible, you say? Nope. That’s the magic of a water-fed pole. The water is purified through the process of either deionization or reverse osmosis to filter out all the impurities. You see, it’s the impurities in the water that leave the streaks, the spots and the drip marks. 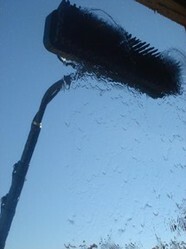 In fact, the reason you squeegee the water off the glass in traditional cleaning is to remove the water, not the dirt. is a bit of a learning curve but many professional supply houses have training seminars. Water-fed poles save time, do a better job and increase profit margins. What’s not to love?! Check one out today for your window cleaning business. For more information on water fed cleaning, this is a great source for both professionals and homwowners. Does Anyone Spring Clean Anymore? If you have those little brown pantry moths flying about your kitchen and breeding in your food (yuck! ), don't despair. You can win the battle with the methods on this page. Spring Cleaning is the act of doing a thorough job of cleaning your house from top to bottom in the Spring time. Yet, I never hear anyone talk much about it today.